Gaius Valerius Flaccus was a consul of the Roman Republic in 93 BC and a provincial governor in the late-90s and throughout the 80s. He is notable for his balanced stance during the Sullan civil wars, the longevity of his term as governor, and his efforts to extend citizenship to non-Romans. After Sulla emerged victorious, the senate authorized Flaccus to strike coinage to cover expenses for his final months in command. 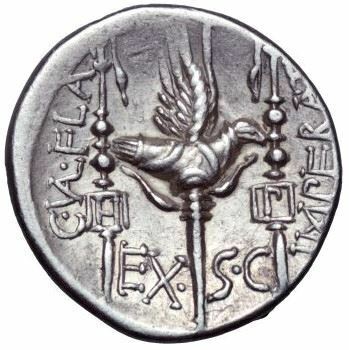 In 82 the mint in Massalia issued a denarius depicting a winged bust of Victory and a caduceus on the obverse. The reverse shows a legionary aquila flanked by military standards. The one on the left is marked with an H (for Hastat), the one on the right P (for Principes).